Kingston Citizens: Niagara Bottling Company Project. YOUR WATER IS IN PLAY. Click on the image to view the film “tapped” that examines the role of the bottled water industry and its effects on our health, climate change, pollution, and our reliance on oil. We have recently created a Facebook invitation for the next Common Council meeting on Tuesday, October 7th. Please consider coming to speak during public comment (at the beginning of the meeting) on the proposed Niagara Bottling Co. plan to bottle and sell Kingston City Water. The timing here is crucial, given that the group has apparently been in private talks with City officials for several months. Media reports say that they are planning to get moving as early as 2015. 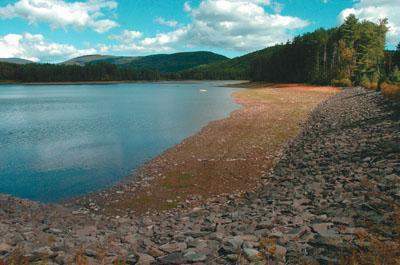 The City of Kingston’s water source COOPER LAKE had its last drought conditions in September of 2012. Kingston citizens are encouraged to attend the next Common Council Meeting on TUESDAY, OCTOBER 7th at 7:30pm. * REQUEST THAT THE COMMON COUNCIL ORGANIZE A PUBLIC MEETING ON THE NIAGARA BOTTLING COMPANY’S PROPOSAL TO USE KINGSTON CITIZENS WATER SUPPLY TO BOTTLE AND TO SELL. * Furthermore, to ASK THAT A RESOLUTION BE DRAFTED TO PROTECT KINGSTON’S WATER SOURCE BY CLARIFYING THAT IT BE USED FOR TAXPAYING RESIDENT CONSUMPTION AND NOT FOR USE BY PRIVATE COMPANIES TO BOTTLE AND TO SELL. * CALL THE MAYOR’S OFFICE AND YOUR ALDERMAN. * SHARE THIS INFORMATION. LETS PACK CITY HALL ON OCTOBER 7th. RESIDENTS CAN SPEAK, OR JUST BE PRESENT TO WITNESS AND TO SUPPORT A COMMUNICATIVE PROCESS. “Start Up New York” is an initiative created by Governor Cuomo to attract new business to NY State. As an incentive, they are forgiving taxes with abatements for ten years. To take advantage of this, it was recently announced that Niagara Bottling Company out of Irvine California was interested in opening a production facility in the Town of Ulster, where the TOU Planning Board would take a lead role. 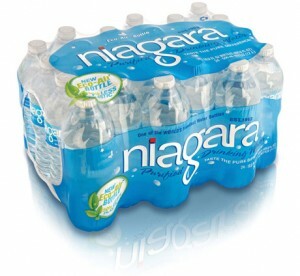 For Niagara to come to the area, however, they would need a local water source and are looking to the City of Kingston’s Cooper Lake to bottle and to sell. According to reports – as a starting point, Niagara would purchase one million gallons of our water per day (GPD) with up to 50 trucks moving out of the facility 24/7. At full capacity, their requirement would be 1.75 million GPD of our water, requiring an additional pipe line that they would install (concerning), with up to 260 trucks in and out of the facility 24/7. It looks as though some or all of the 342,500 gallons of good drinking water per day, based on their proposal, would be used to cool new plastic bottles during production. They call this “non-biologic waste” that they ‘envision’ being disposed of into the Esopus Creek. The City of Kingston’s Water Board is independent. Probably left over from our long ago ‘Commissioner’ form of government. The current members include Joseph DeCicco (President), Al Radel, Robert Niedzielski, Raymond McSpirit, Dennis Croswell and the City of Kingston’s Mayor Shayne Gallo. Kingston’s Cooper Lake reservoir in drought in 2012, where the water levels were down 12.7 feet. The City of Kingston’s Water Department Superintendent Judy Hansen (with what we can only assume had Board approval, including the Mayor of Kingston who sits on the board) has issued a “Will share” agreement without the knowledge or approval of the Common Council. (Ward 2 Alderman Brian Seche is council liaison to the Water Department. It isn’t known at this time if he was aware of the proposal or had attended any of the meetings). “Will share” means that the board is confident that Kingston can provide the requested amount of water to Niagara to bottle and to sell and still service the needs of the community. They have not yet negotiated the water rate. The project appears to have been on the table for some time, and according to this week’s Kingston Times, in order to not “kill” the project they kept it quiet until their presentation on Tuesday September 16th in front of the Town of Ulster’s Planning Board. The presentation, by the way, was not the Planning Board’s agenda. The announcement of the Town of Ulster’s leading role was released two days later in the media. Here are some items to consider. 1. Section C11-5 speaks of Kingston being able to supply water to ‘other than inhabitants of the City of Kingston and outside the corporate limits, etc”. This indicates residents. Not private companies. 2. The common council must “assent in the way of constructing and maintaining waterworks for supplying said city and its inhabitants with pure and wholesome water; exercise such powers as are necessary and proper to accomplish such purpose and shall proceed in the manner hereinafter prescribed.” What does that mean here? That any transaction must move through council, as selling our water – particularly in the midst of climate change and drought – has got to be weighed cautiously. We are not certain if Water Department Superintendent Judith Hansen has the authority to issue a ‘Will Serve’ agreement as she has done. The council is the last word in gauging what may or may not jeopardize Kingston citizens in receiving water in the future in any way. They have not yet had the opportunity to voice in. In the way of jobs – they offer some and it’s attractive. We all want them. However, we must counter the benefit with what may be the future costs of potentially needing a new water source and its infrastructure in the case we are drained dry. Might a business with a home base in California be concerned if we were ever in that boat who comes to the area for 10 years tax free? It’s reasonable to be skeptical. Cooper Lake is not an aquifer. It’s a man made lake fed by a very small stream. Is it going to have the capacity to fill their need and ours over the course of 10 years? Is there a back-up source in place in the case that Cooper Lake can no longer provide the community with water? Work with your elected officials to identify the pros and cons of this deal. Future generations of Kingstonians are counting on us all to make sound decisions. Jobs: Urban Agriculture and Niagara Bottling Co. I like the idea of the jobs it will bring, this is good for this area, but the volume of water should be add to the town of Ulster allotment and not added on to the towns. If one million gallons a day is sustainable without affecting the citizens of Kingston go for it but make Niagara RECYCLE the 345000 gallons to be used daily in the plastic bottle process. Niagara has the funds needed to build a recycling plant sized to process 345000 gallons daily and recycling would cut their daily need for fresh water significantly! Throwing away 345000 gallons of fresh water daily is criminal in light of the coming effects of climate change! This is a very good point. We need to understand better the use of the 345,500 GPD in the proposal. It is also not clear whether this amount is a part of what they are requesting (1 million GPD and up to 1.75 million GPD) or in addition. Thanks for participating, and I hope that you will be able to attend the Common Council Meeting on October 7th where the public will speak on behalf of the proposal. More information is certainly necessary prior to the proposal being sent to the State for approval. One more thing that should be regulated heavily, in the case of “recycling” water back into the Esopus creek, is what that water now contains after running over HOT plastic. ever leave a water bottle in the sun too long? How would this change the water flow? where will the water be distributed after bottling? those trucks are going to need better roads and access. It sounds like much of the proposal is for a bottle making plant, made from fossil fuels and with the runoff going into the Esopus Creek. Why? Why waste our pricious water this way? The water mining and fracking industries seem to have a lot in common. When fracking was proposed in other areas the citizens were told how it would benefit everyone. Then the companies came in and destroyed everything they had. We need industry in Kingston, but water mining is NOT the answer. We need government help to create good sustainable jobs, but NOT at the expense of further poluting our world.